Acquavella Galleries‘ exhibition “Georges Braque: Pioneer of Modernism” is an homage to the other father of Cubism, most often associated with Picasso. Curated by Dieter Buchhart, the exhibition features more than forty paintings and papiers collés culled from various international collections. “Georges Braque: Pioneer of Modernism” is the first major retrospective of the artist’s work since the late 1980s, and is open through November 30th. Georges Braque, Landscape at L’Estaque (1906). Braque’s earliest works were impressionistic, but his style greatly changed after viewing a Fauvist exhibition. Stylistically, Fauvism is characterized by strong brushstrokes and bright, expressive colors, most famously seen in the works of Henri Matisse. 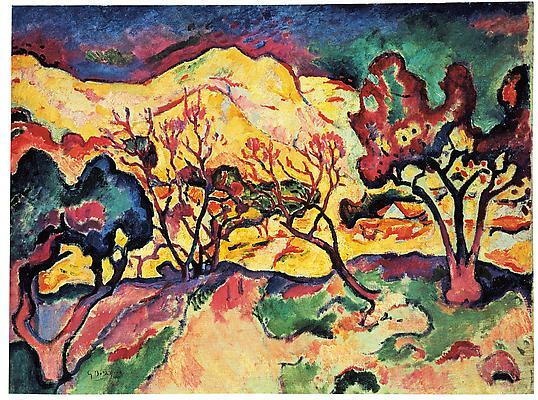 In Landscape at l’Estaque from 1906 Braque’s landscape vibrates with colors: golden mountains, red trees, and a pink-blue sky. The heightened colors infuse the scene with intensity; it is as if we are waiting for the storm. 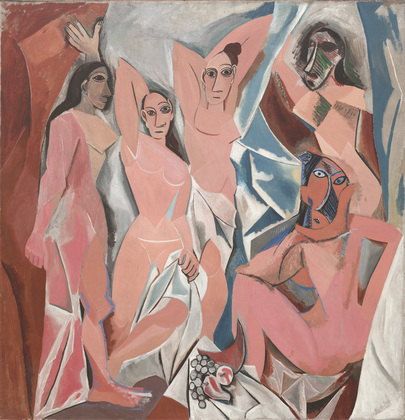 Pablo Picasso, Les Demoiselles d’Avignon, (1907). Image via The Museum of Modern Art. One year later, Pablo Picasso—who Braque is paired with and also often overshadowed by—painted his Les Demoiselles d’Avignon, inspiring Braque to develop his own Cubism. The two artists collaborated intensely until 1914. Cubism, their movement, both deconstructs and reconstructs objects while simultaneously representing them from numerous vantage points. Many of his earlier Cubist works feature a less than vibrant palette of colors: 1909’s Harbor is a mix of browns and greys. 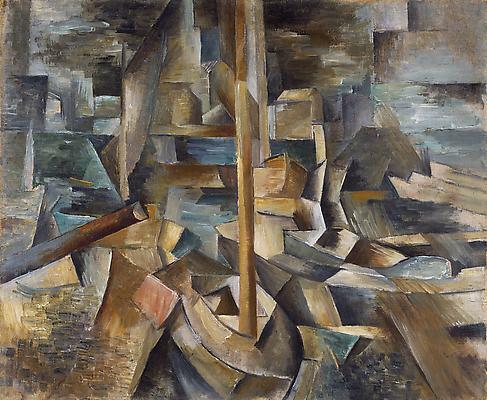 Here, Braque has taken apart, and rebuilt again, a harbor of ships, and we can make out the hull and mast of one central boat. Even the sky has been broken up into angular shapes. 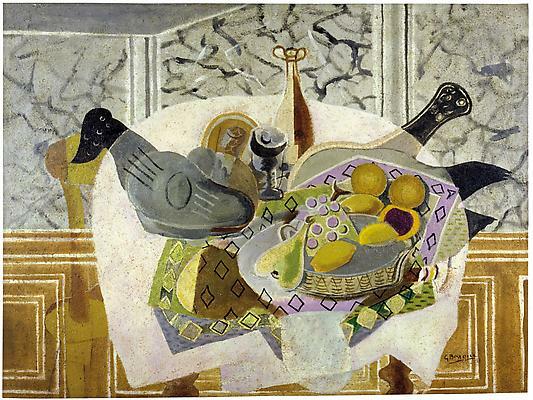 Georges Braque, The Mauve Tablecloth (1936). 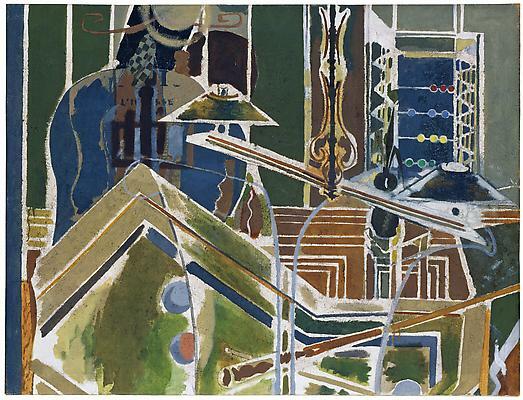 Georges Braque, The Billiard Table (1945). 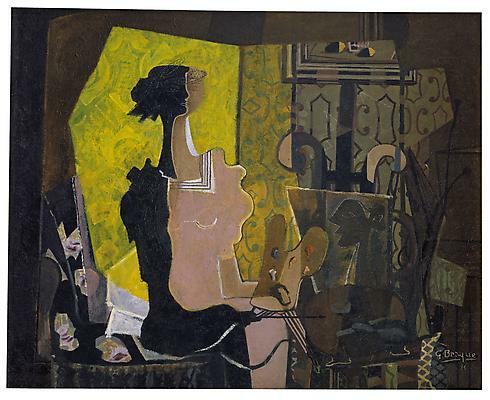 Braque is known for his Cubist still-life images and they became his means to experiment. The Mauve Tablecloth from 1936 is a fragmented dinner table. The cloth is covered with fruit, bottles, and the requisite guitar. The image is as disjointed and broken as any Cubist portrait, but we still as the viewer understand what we are looking at. Braque’s style becomes even more abstracted in his later paintings: the 1945 The Billiard Table mixes oil and sand on canvas, and the colors used are rich and deep. Without the cue stick, the subject of the painting might be difficult to discern amidst the geometry. This entry was posted on Monday, November 7th, 2011 at 2:02 am	and is filed under Art News. You can follow any responses to this entry through the RSS 2.0 feed. You can leave a response, or trackback from your own site.